This toolbar contains special buttons holding structure templates, graphical objects or textboxes. The toolbar can show different template groups. 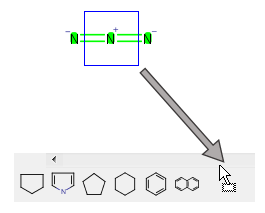 Checking the 'Use molecules as templates at 2D cleaning' checkbox will effect the structures containing that template during cleaning of the structure: the default cleaning form is overwritten by the template structure. This way, you can cutomize your drawings: add or draw a set of templates and check this option. Any structure can be added to the My Templates group. Any graphical object can be added to the My Templates group from the pop-up menu. Set the name of the new template. Right-click on the template icon on the template toolbar and select Properties. 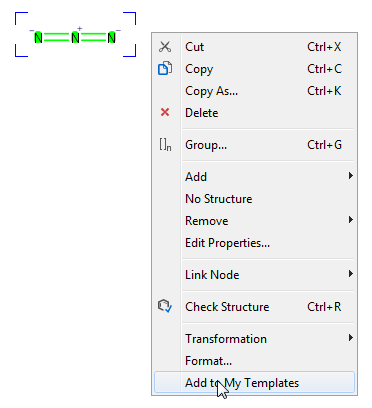 Set the name and/or the abbreviation of the template in the Template Properties box. 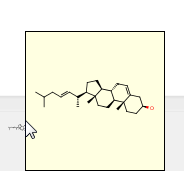 After that the template is identified with its name and/or abbreviation. If the template does not have a name, hovering the cursor over its icon on the template toolbar magnifies the image on the icon. This improves the visibility of the template icon, especially for big structures. Remove template(s) from the toolbar. Right-click on the template icon and select Remove to remove the template from the toolbar and from the My Templates list.